$74.5 (1 bid) WATSON Sterling Silver Souvenir Spoon FOUR SEASONS WINTER Figural Woman 6"
$154.49 (2 bids) Japanese Sterling Iris Coffee Pot c1950 Miyata - 37 Oz. $327.0 (2 bids) Redlich Sterling Coffee Pot c1910 Jensen Taste - 40 Oz. $621.0 (6 bids) Redlich Sterling Tea Set c1910 Jensen Taste - 74 Oz. 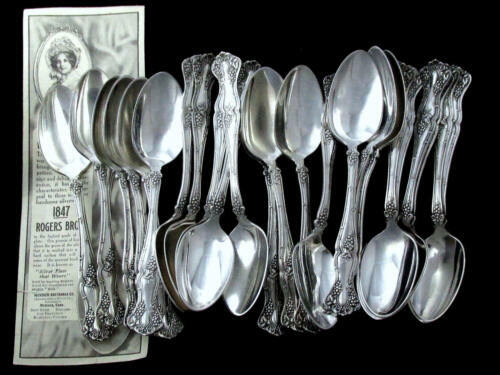 Buy: $975.0 GORHAM ETRUSCAN STERLING FLATWARE 67 PIECE MONO "R"
$10.75 Alvin “Brides Bouquet” Silverplate Teaspoons (5) From Early 1900s No Monogram!